Almost all of Michael’s family are teachers, many of whom taught him as a child in Uganda. When he became a refugee in 1987, he was instrumental in forming groups for teaching basic skills to other refugees, supported by JICA (a Japanese organisation) and a Kenyan charity. 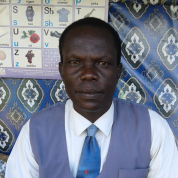 After gaining a master’s degree, Michael set up the first secondary school in the IFO refugee camp in Kenya. Students are taught by Kenyan instructors as well as refugee teachers from the camp’s various ethnic communities. Although the camp is prone to radicalisation and violence, Michael has found ways to control student behaviour by introducing competitions, weekly and monthly tests and awards, and social clubs. He discovered that interventions by the students’ Counselling Club, English Club, Christian Union and Islamic Society helped defuse conflicts. Students have performed well academically and at least 125 of them have gone on to study at overseas universities. Michael has tried to use his influence as a respected teacher to speak out at assembly time against caning, abusive language, disrespect for other communities, and early marriage. He also helped launch a campaign to enrol all children in the camp’s schools and dissuade parents from sending them to religious institutions instead. Join the #TeachersMatter movement by sharing Michael Kagwa’s update.